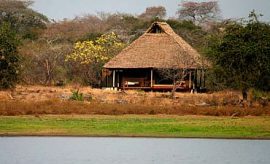 Located in the heart of the Selous Game Reserve, Rufiji River Camp is a fantastic location to enjoy the flora and fauna of Africa during your personalized Tanzania holiday with AfricanMecca. This family managed camp (Foxes Family) is situated on the banks of the Rufiji River, giving you front row seats to watch hippos shade in the waters and display their enormous mouths as they yawn. The waters of the river are also home to the incredible crocodile that lounge on the banks and maneuver silently through the water, watching for prey. Other types of wildlife come to the river's edge to drink, giving you abundant opportunities to see wildlife from the comfort of the camp. 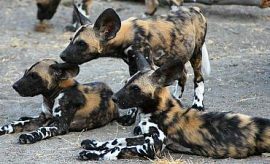 As you plan your active-adventure vacation visit to Africa, you may choose from game drives, boat safaris and walking safaris to see the diverse behavior of the animals, such as hyenas fending off their meal from a pack of rare African wild dogs. 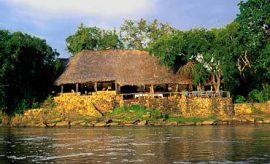 When you are at Rufiji River Camp, speak with the staff to find out if seasonal fishing activities are available. 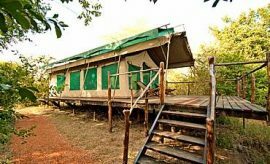 With ecosystems ranging from bush to open savannah, Rufiji River Camp gives you the perfect location to learn about the flora of Selous Game Reserve during your tour of Africa. More than 2,000 plant species have been discovered, such as the African giant -- the mythical baobab that has an average lifespan of 300 years and grows to a diameter of 10 meters or more. Walking safaris from the camp are an excellent way to see baobab trees and others, such as tamarind, mango, acacia, palm and many more. AfricanMecca guests can enjoy spectacular river and sunset views from one of the 14 tents at Rufiji River Camp. Inside, you relax on a large comfortable bed and refresh yourself in a lovely, well-appointed bathroom. 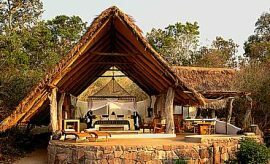 The tents are designed with local materials, such as thatched roofs, timber boarded floors and partly hand-carved furniture. 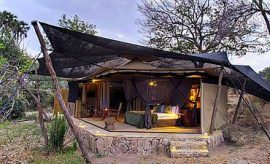 As your exhilarating African wildlife safari unfolds, record your experiences in your journal while sitting at a convenient writing desk inside your tent or at a safari table on your private deck. 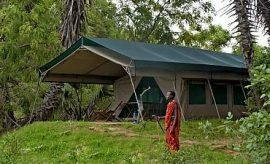 For your safety and convenience, the tents have mosquito netting, and you are given room insect repellent for use at night though you should come with your own for body use. 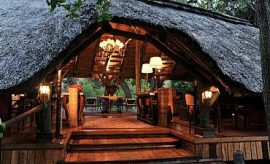 Rufiji River Camp also provides you with several common areas to enjoy during your trip to Selous, such as a fully-stocked bar, sitting area around a large campfire, library and many other places to gather or enjoy a quiet moment alone within the African bush. 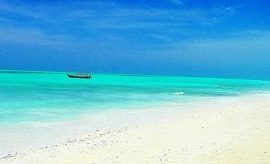 The professional staff are knowledgeable and eager to teach you about the African ecology and cultures of Tanzania. Families on safari with young children are welcome at the camp, but must always be accompanied by an adult at all times, and parents should educate their children on the wildlife and associated risks of being in the wild. Rufiji River Camp also provides you with 220-volt electricity at the bar, solar-power inside your tent, safe deposit box at reception and a personal safe inside your tent. 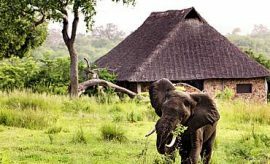 For your Tanzania safari in Selous, game drives, boat safaris and walking safaris are offered by Rufiji River Camp in the early morning and late afternoon to avoid the heat of the African sun, and you typically have time for two activities per day. Several factors, such as road conditions, river levels, weather and movement of wildlife, influence the available activities for any given day. Full-day and half-day game drives are the most popular ways to tour Tanzania with AfricanMecca because the drives give you the greatest coverage of the reserve, and also safely afford you the opportunity to see the diverse fauna of the Selous Game Reserve including most of the big five. After sharing your wish list of wildlife viewing experiences, you join your guide in an open-sided, shaded 4x4 safari vehicle and head out deep into the African bush. 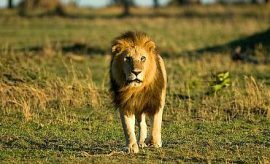 Your guide has an extensive knowledge of the Selous Game Reserve and takes you to locations where your African safari dreams are most likely to be fulfilled. Your guide may also use radio communication with preferred guides to exchange timely information about the animals, such as last sightings, footprints and sounds. As you travel through Selous Reserve, you see African wildlife in ways that you could only imagine before your travel to Africa. Over 800,000 animals live within the nearly 22,000 square mile area (55,000 sq km) of the Selous Game Reserve. Grazing and foraging herbivore, such as elephant, giraffe, impala, buffalo, wildebeest, and many others slowly meander to find the sweet vegetation and water access. Lounging in the trees or hiding in the tall grasses are the stealthy predators, such as lion, cheetah, hyena and many more. The reserve's many water sources are home to hippos and crocodiles, and you may see a member of one of the hundreds of species of birds during your boating safari. Additionally, your guide during your walking safari helps you listen for distinct birdlife calls, such as the loud croaking of a grey heron and identify other avi-fauna on the Selous skies (read more on when is the best time to visit Selous for a Tanzania safari). Locally sourced ingredients are used to prepare excellent meals to keep your energy high for your Rufiji River Camp safari experience. Breakfast is served early morning, giving you plenty of time to savor delightful dishes before your morning activity or even after if you prefer. The choices include "full English" or European" options, such as toast with sweet jam or marmalade, homemade muesli, fresh fruit, assorted cheeses, boiled eggs, omelets, fresh pot breads, waffles, pancakes and much more. Lunch is served around mid-day on return from your morning Selous activities and relaxation, and supper is served after pre-dinner drinks by the campfire. Local and international dishes are prepared for you, such as meat, fish, poultry, soups, salads and many others. Vegetarian options are also offered, and the delectable desserts are sure to satisfy your sweet tooth. The selection of beverages for your meals include coffee, tea, wine, beer, spirits, fruit and herbal infusions, fresh juices, bottled water and many others. At sunset, order your favorite cocktail from the bar and watch the African sun surrender to the dark night. AfricanMecca guests may also request packed bush meals to enjoy during their tour of Selous. These meals are served during your full day Selous game drive, boat safari or your exploratory walking safari in the wilds of Tanzania, and allow you to replenish your energy without returning to camp. Refreshments are also available in your safari vehicle. 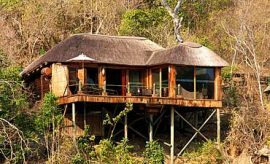 When staying at Rufiji River Camp in Selous, we recommend combining it with offbeat parks in Southern and Western Tanzania such as Ruaha or Katavi ending with a chimpanzee trekking safari at Gombe or Mahale.